The dual-FOV Raman lidar technique, which is explained in here, allows profound investigation of aerosol-cloud interactions. 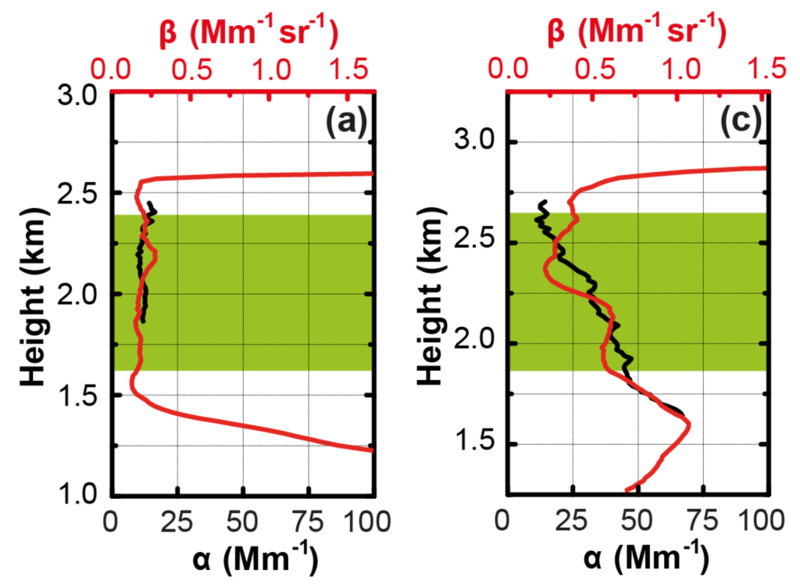 Profiles of cloud microphysical properties can be obtained with this technique. In combination with the conventional data analysis methods for multiwavelength Raman lidar measurements, which give detailed information about aerosol properties below investigated clouds, comprehensive datasets can be obtained. Such comprehensive datasets are necessary for appropriate investigations of aerosol-cloud interactions as these processes are very complex. Fig. 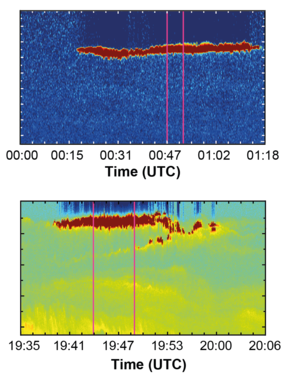 1: Two lidar measurements of liquid-water clouds that formed under contrasting ambient aerosol conditions. top: clean conditions. bottom: polluted conditions. Figure 1 shows the time-height cross section of the range-corrected lidar signals at 532 nm. The measurements were performed on 26 July 2011 and 5 September 2011 in Leipzig, Germany. Strong signals, shown in red color, indicate the probed clouds. Aerosol layers are indicated with yellowish and greenish colors whereas blue colors represent low lidar signals and thus a comparably clean air. 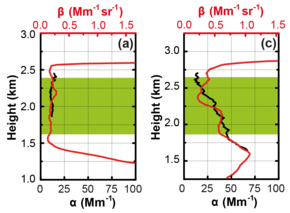 Fig 2.: Profiles of aerosol extinction coefficient for the measurements shown in Fig 1. Left: clean conditions. Right: Polluted conditions. The retrieved profiles of the extinction coefficient below the cloud are displayed in Figure 2. On 5 September 2011 a much higher extinction was measured, with a mean aerosol particle extinction coefficient of 30 Mm-1 below the cloud, which is about a factor of two to three higher than the corresponding value on 26 July 2011. The observed cloud response to this difference in aerosol load, shown in Figure 3, is according to the predictions of the Twomey effect. At the lower part of the cloud smaller effective radii are obtained for the cloud with a higher aerosol load below. The corresponding cloud droplet number concentration (CDNC) is increased. These findings can be explained with an increased concentration of cloud condensation nuclei (CCN) due to the higher aerosol load. Updrafts carry these CCN into the cloud which leads to cloud droplet formation. Hence, the CDNC is increased at the cloud base. As the liquid water content is similar, this leads to smaller cloud droplets. Fig. 3: Microphysical properties for the clouds shown in Fig. 1. Red curve: polluted aerosol conditions. Blue: Clean aerosol conditions.